Good news is here for those ladies who are searching for bright, colorful and chic dresses for wearing on festive Eid that will give them comfortable and modish looks especially in these hot days of summer. All of these ladies should at least one time try clothing of well known brand “Taana Baana” along with its complete catalog. In catalog of Taana Baana Spring Collection 2015 they would like to introduce an inclusive diverse range and variety of festive Eid dresses which are full of dark, light, bright and cool shades and themes with innovative pattern and prints. All these shirts are available in medium length which are stylized as well as tied with cigarette pants that are ornamented with stylo buttons or trousers. Furthermore the dupattas are also made with sensational mind and as per modern ethnic designs. Phulkari Eid Lawn 2015 by Taana Baana comes along with both heavily and light embroidery pieces or patches of booti work and some of them having a touch of screen block prints with different colors and shades of thread work. It’s all dresses consist of medium length of shirts with pencil trousers, cigarette pants or capri pants because every lady knows that currently different style of fashion is in and it is bit difficult for brands and designers to follow these fashions on time for fulfilling the need, demand and requirement of its clients inside Pakistan and international countries. Taana Baana Embroidered Festive Eid Collection 2015 comes both in fashion of semi formal and casual wear and ladies desires to wear fresh and novel clothes along with dazzling and appealing cuts which are in current fashion especially on Festive Days of Eid. Colors that are added by Taana Baana in its Phulkari Eid Collection are purple, yellow, sea green, grey, orange, shocking pink, white and more. 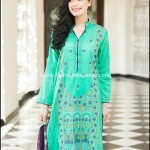 Prices of all these apparels start from rupees 2800 PKR which are quite affordable by all. Check below here Taana Baana Embroidered Festive Eid Collection 2015 complete catalogue with prices.